3 WAYS TO GET UP TO $350!! Scratch & Win Promotion – Up to $100 (for a split system)! 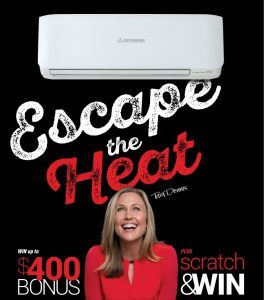 Get Fully Wired to supply and install a Mitsubishi Heavy Industries air conditioner, go online to claim up to $100, and Scratch & Win for your chance to DOUBLE or TRIPLE your cash bonus! 2) Fully Wired Google Review – $50! Simply register Fully Wired as your installer for your Mitsubishi Claim and leave a Google Review and we will give you CASH BACK! See the attached information on your invoice. 3) Energex Peak Smart Reward Program – Up to $200! Get rewarded for energy efficient air conditioning by getting our qualified electrician to install a Peaksmart device on your new eligible Mitsubishi air conditioner! Visit the Energex website for Terms and Conditions. TODAY to arrange a quote!